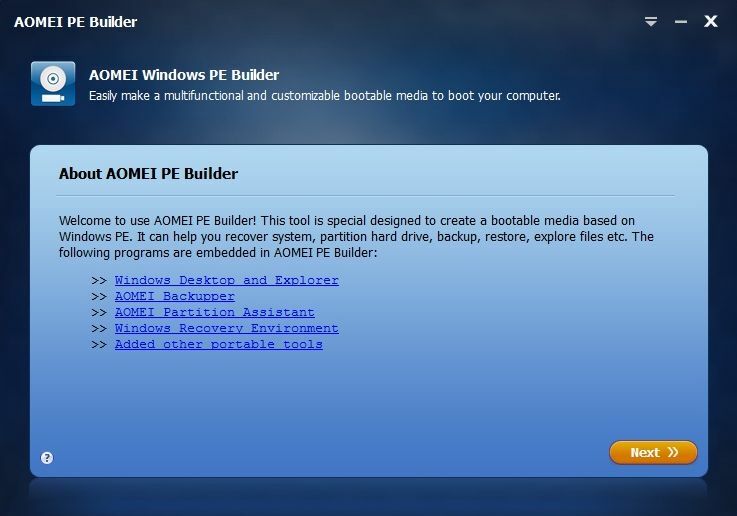 AOMEI PE Builder helps you to FREE create a bootable environment based on Windows PE without installing AIK/WAIK, which integrates a set of tools that enables you to boot up your computer for easy maintenance and fast recovery tasks when the native system is corrupted or cannot be used. 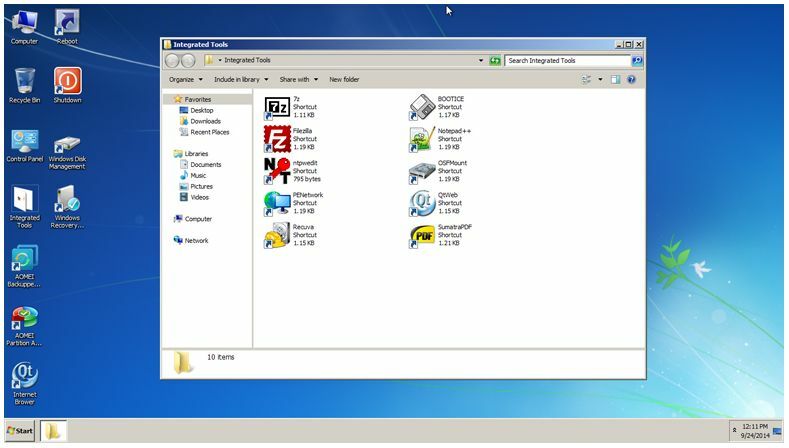 Unlike traditional WinPE environment, it brings you a user-friendly graphical interface and a familiar Windows environment, including desktop, Windows explorer, start menu, taskbar, etc. It is easy to use just like using Windows 7. 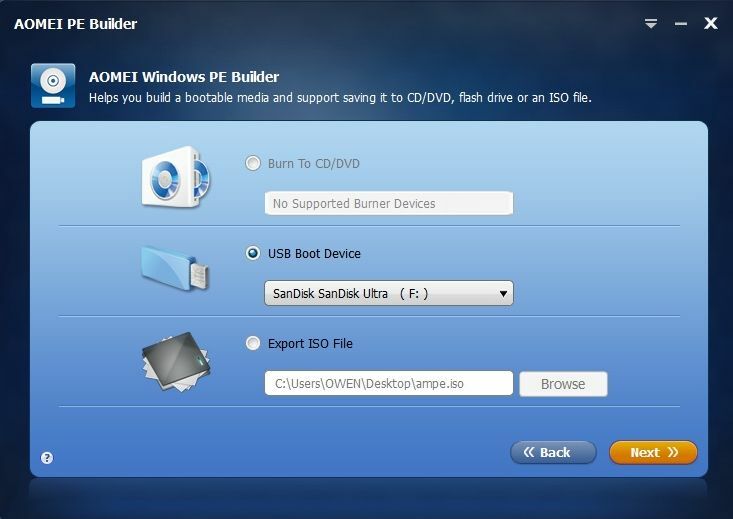 The Windows PE bootable media can be a CD/DVD disc, USB flash drive, or ISO image file, so you can choose the most convenient one according to your preference. Everything: is search engine that locates files and folders by filename instantly for Windows. Notepad++: It’s an editor and Notepad replacement that supports several languages. SumatraPDF: It is a free PDF, eBook, XPS, DjVu, CHM reader for Windows. Q-Dir: Quad Explorer, makes your files and folder easy to manage. Recuva: a supremely user-friendly file recovery tool. PENetwork: a small utility to install and manage different network settings in a Windows PE. Filezilla: a fast and reliable cross-platform FTP, FTPS and SFTP client with lots of useful features. QTWeb: lightweight, secure and portable browser having unique user interface. OSFMount: allows the analysis of disk images and mount image as a virtual drive. BOOTICE: allows you to modify, backup and restore the MBR and the Partition Boot Record. NTPWEdit: A password editor, it can change or remove passwords for local system accounts.